Highly organized and systematic employee, having considerable experience and expertise in all sorts of stock management including Inventory Control System, Warehouse Database, Logistic Analyzing and managing retail team members. Able to lead, motivate and empower staff at their daily tasks to improve their performance. Communications -- Good written and verbal presentation skills. Use proper grammar and have a good speaking voice. Interpersonal Skills -- Able to get along well with co-workers and accept supervision. Received positive evaluations from previous supervisors. 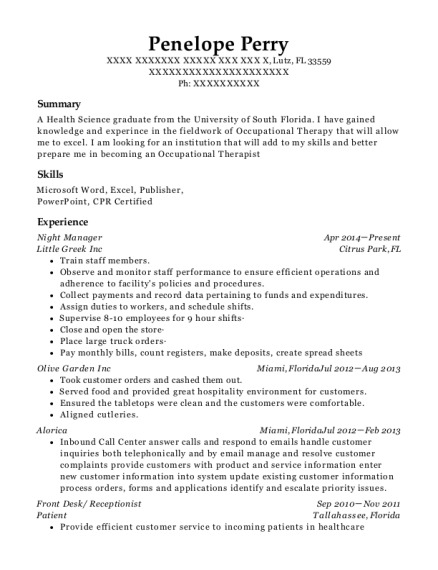 Flexible -- Willing to try new things and am interested in improving efficiency on assigned tasks. Attention to Detail -- Concerned with quality. Produce work that is orderly and attractive. Ensure tasks are completed correctly and on time. Customer Service -- Routinely assist customers finding specific products. Reliable -- Excellent attendance record; trusted with safety of fellow team members entering and exiting premises. Certification-- Stand-up/Sit down Forklift, Reach truck single, double, triple electric pallet rider also Familiar with RF Units. Night Manager Aug 2013－Present Kroger Dallas, Tx Assist in ordering merchandise and supplies to maintain appropriate inventory levels and maximize sales without merchandise out of stocks. Correctly verify the delivery of all merchandise and insure that all employees do the same. Ensure that the correct pricing is maintained and that all merchandise is in-code and available for sale. Maintains high standards of store image ensuring that the store is clean, well-stocked, and ready for business. Shipping and Receiving May 2006－Jun 2013 Target Warehouse Distrubution Center Midlothian, Tx Safely and efficiently handle and move merchandise using power equipment as needed. Receive and unload cartons or pallets from trailers. Maintain carton count accuracy in the warehouse. Unload cartons from electric conveyor and stack onto trailer. Locate and remove pallets of merchandise in storage locations. Successfully complete Physical Abilities Test. Use technology to monitor carton count. Process orders quickly and efficiently. Move merchandise weighing up to 60 lbs. Crosstrain and work in other departments as necessary. Grocery Dept. Supervisor Apr 1996－May 2006 Tom Thumb Desoto, Tx Responsible in assisting other store crew with their task and assuring that they are performing their job well. Supervise the flow of service in the store and act as the acting officer if the presence of the Manger is not available. Assist other store employees with their work, Disseminate tasks and orders to employees, Train and evaluate trainees, Check the flow of the store from time to time, Check the products before the opening and closing of the store, Encode the delivered or ordered materials or products, Assist the customer with their demands, suggestions and complaints, Communicate with the manager regarding the sales, employees and other important matters. Act as officer in charge whenever the presence of the Manager is not available. 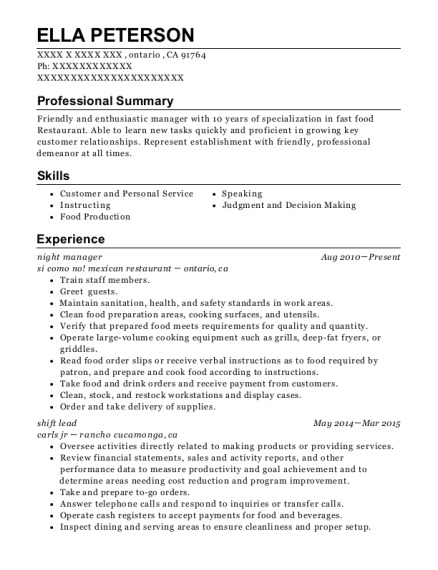 This is a resume for a Night Manager in Dallas, Texas with experience working for such companies as Kroger and Pro Logistics. 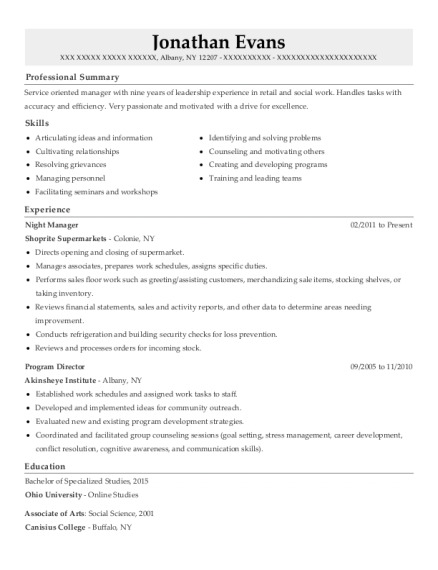 The grade for this resume is 0 and is one of hundreds of Night Manager resumes available on our site for free. 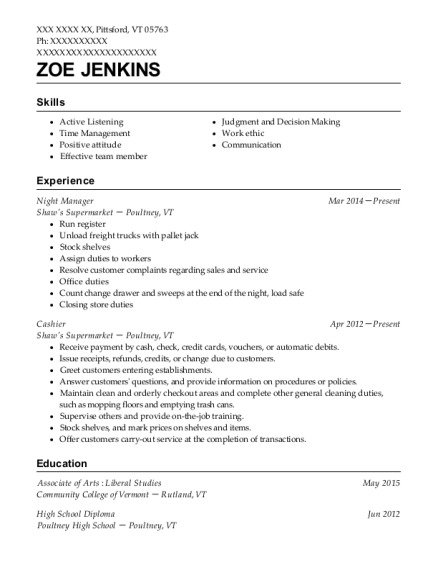 Use these resumes as templates to get help creating the best Night Manager resume.